Can Fitbit Help the Office Parking Problem? The Fibit is one of many social media wearable smart pedometers in the market today. 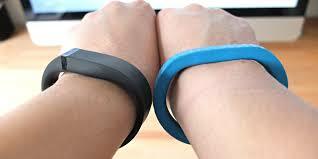 The Fitbit (like the Nike Fuelband and the Jawbone Up) tracks your steps, calories, miles, and aerobics. You can share your results with friends also using the device and create a competitive environment. Walking can burn calories. You get almost as much calorie burn per mile whether you run or walk, although you will not get the same cardio benefits in a walk. The Fitbit or these other devises try to get you addicted to walking. The goal is at least 10,000 steps a day. If you subtract 3,000 steps you would get anyway in daily living, you achieve about 7,000 extra steps. That can equate to a little over 3 miles per day (equivalent to a half hour or more run for many). Our office building at 10951 Pico Boulevard is a third of a mile from plentiful free parking along the new Expo Line. We can give employees who give up parking a Fitbit if they use the Expo Line parking. Each day, the employees would get 1385 fit bit points (steps) for a seven minute walk to and from work toward their 10,000 steps. Thus, both the exercise and parking problems are solved.